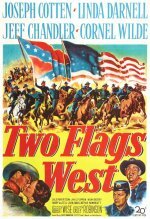 It took a lot of nerve for anyone but John Ford to make cavalry westerns, but writer/producer Casey Robinson and director Robert Wise gave it a good try with this dramatic story built on the fact that Confederate prisoners were allowed to serve in Union army posts out west during the Civil War. Jeff Chandler makes a strong impression as an embittered commanding officer; Joseph Cotten is the Confederate leader plotting to escape; Cornel Wilde is a Union captain; while Linda Darnell is the army widow coveted by all three men. There's more talk and less action than in most westerns, but director Wise brings the fort setting to life and stages the final Apache attack with considerable vigour. Confederate soldiers held prisoner during the American Civil War are offered their freedom if they travel to a remote outpost and help defend it against Kiowa renegades. However, tension mounts as they are forced to fight side by side with their Union enemies. Western, starring Joseph Cotten, Linda Darnell and Jeff Chandler.